I didn't purchase a lot of new clothing this summer, but I did get some great bargains on a few pieces. For example, I purchased this dress by Tracy Reese, plus one in the same style but with a different print, at OFF 5th (the outlet for Saks Fifth Avenue) at the beginning of summer. They were marked $19.99, which I couldn't believe. I think the reason for this low price was probably that the sizes were way off in this particular dress. I am normally a 4 or 6 in dresses and this one is size 10, so close to double my normal size. When I saw it on the rack, however, it looked like it would fit, so I decided to try it on anyway and I am glad that I did! I could easily throw a denim jacket or cardigan over this dress for fall, which I will probably do, but because it's hot here, I wore it as is with a fedora hat. Last summer, I also purchased a couple of straw fedora hats, including this one, from OFF 5th. (As you can see, I do a lot of outlet shopping!) I am not really a hat person, but I have found that they are a useful accessory to shield yourself from the sun, while looking fashionable at the same time. The other nice thing about hats is that they are one size fits all, so you don't really have to worry too much about getting one that fits or about crazy sizing like the incident I had with this dress! At this point, I only have two straw hats in my collection, but I certainly wouldn't mind adding a few more. 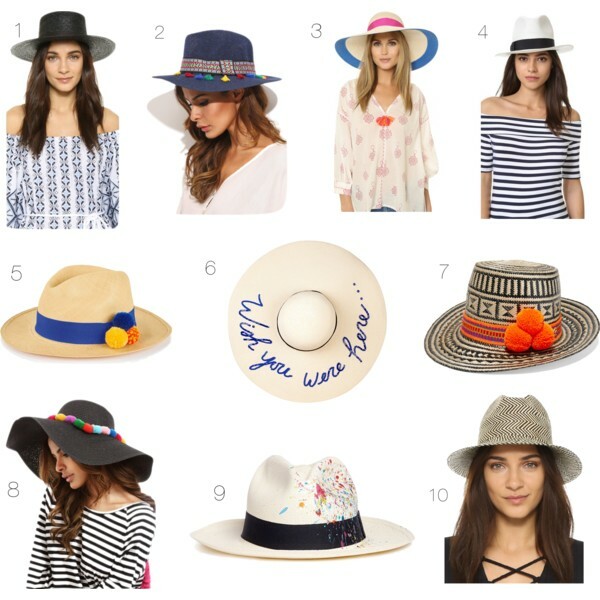 Below you will find some of my favorite hat finds. I tried to select ones that are unique with fun patterns or embellishments, such as pom poms and tassels. I also tried to select a few that, by virtue of being in darker colors, transition nicely into fall, since fall is rapidly approaching! You got such a great deal on the dress. The print is really fun. You are the queen of color! The bag looks amazing with this dress too! What a fun dress, and you can't beat that price! It was smart of you to ignore the size on the tag too because it clearly works on you! One thing I planned to do this summer was get a hat and I never did... I always see them on other people and love them! 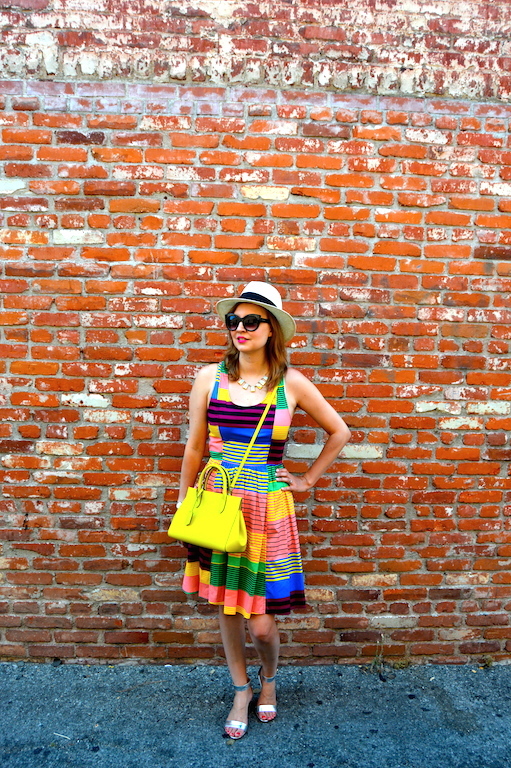 Your outfits are always so fun and colorful! Love it! That dress! What a find .. and what a great price! I'll noticed that sometimes the clearance rack stuff is off in sizes so for those of us with a bit more patience we can find the right size if we're willing to try on a wide range! 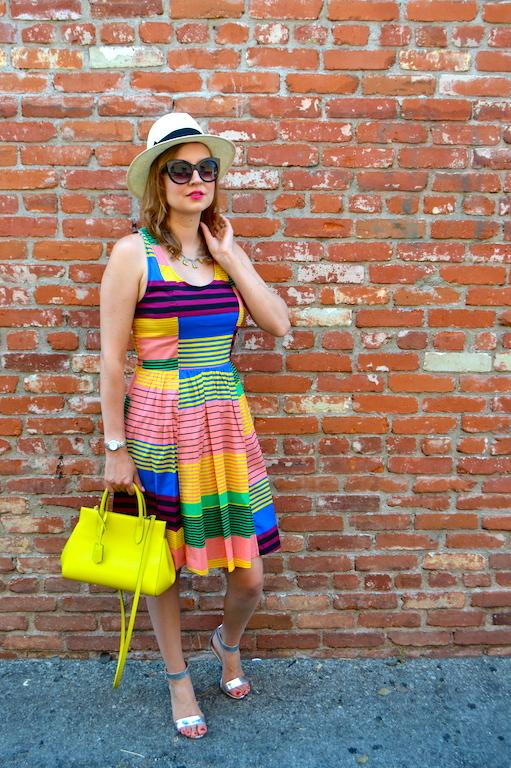 Thanks for much for linking up with Fun Fashion Friday! Enjoy your weekend! 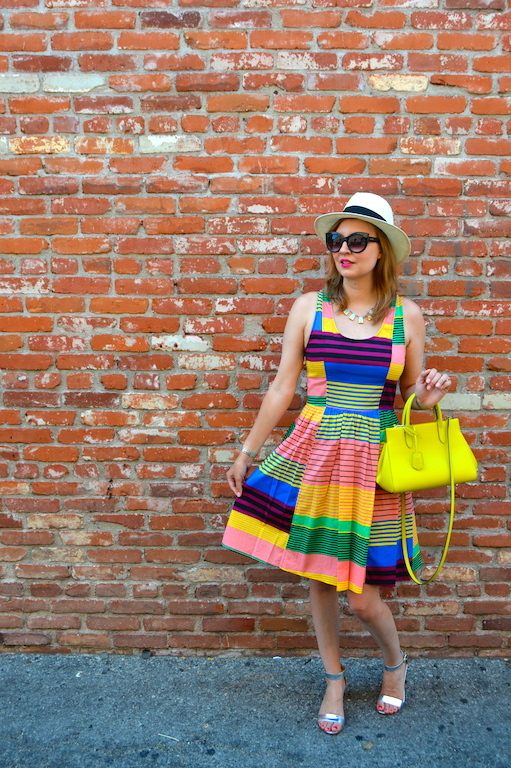 I love the colors and patterns on this dress, Katie! It looks amazing on you and so bright and cheerful. 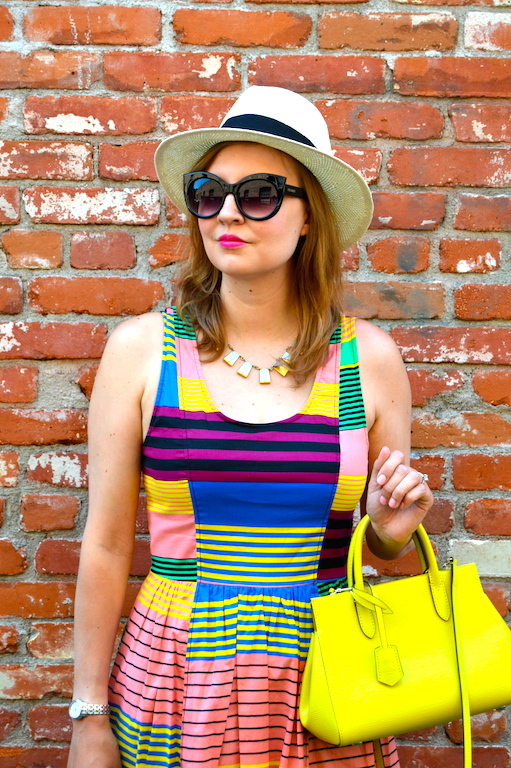 The extra pop of yellow from bag is perfection!